The Cap d’Antibes remains one of the most exclusive addresses of the French Riviera, with any Cap d’Antibes villa coming to the market being highly sought after for both the private and elegant properties and estates found throughout the Cap and the stunning natural location. Exclusive top-end rental properties are also in high demand, making a Cap d’Antibes villa a lucrative investment property, as well as a highly desirable first or second home. The Cap is known for its luxurious properties as much as the big names that are known to stay in them, so any buyer of a Cap d’Antibes villa can be sure it has been built or renovated to the highest specifications with a wealth of luxurious finishing touches as standard. The city of Antibes, despite its long history, is known as a modern and forward-thinking town, with all the facilities and cultural venues expected in a modern city, and this is especially true for Juan-les-Pins, known for its outstanding jazz venues and festivals. However, just south of the city, the Cap d’Antibes seems to be a world away from the modernity and bustle of the city, despite being barely a 5 minute, and very scenic, drive away. The urban metropolis of Antibes soon gives way to lush Mediterranean vegetation, a sheltered bay with yachts bobbing in the sparkling, clear waters and the occasional sight of a Cap d’Antibes villa surrounded by landscaped gardens of olive trees, palm trees and abundant flowers. The Cap d’Antibes remains largely unspoiled and a natural Mediterranean Eden. Of course, as the Cap d’Antibes is a peninsula, almost every Cap d’Antibes villa also boasts spectacular sea views. The peninsula is little more than a mile wide at its broadest point, so no Cap d’Antibes villa is more than a few minutes walk from the coast, whether some of the Cap’s dramatic rocky coastline which is truly spectacular with the waves crashing against the shore sending cascades of crystal into the sky, or the many sandy beaches that are to be found on the peninsula. The beaches of the Cap d’Antibes are exceptionally well maintained, and a large number are private, ensuring that the unique wooded seclusion and spectacular location does not mean they become too crowded. Some of the best beaches are owned by outstanding restaurants that offer a complete waterfront experience, from mooring and collection from private yachts, and secluded beachside facilities to truly top-class Provencal cuisine. Arguably the best way to truly experience just how truly unspoilt an area a Cap d’Antibes villa is located in is by visiting the lighthouse at the tip of the Cap. Here the panoramic view shows the full spectrum of what can be seen from each Cap d’Antibes villa, with sweeping views across the cap, wooded with pines and palms, and across the Mediterranean Sea and the Bay of Cannes, from the Lerins islands to the old ramparts of Antibes. The property market in the Cap remains, and is set to remain, exceptionally buoyant due to its exclusivity, desirability and the extremely restricted development policies. While facilities local to a Cap d’Antibes villa are limited to small shops, the waterfront and beachside restaurants and facilities and the exceptional natural environment and gardens, Antibes and Juan-les-Pins are only a short drive away and the peace, seclusion and beauty of the Cap more than makes this a desirable trade-off. 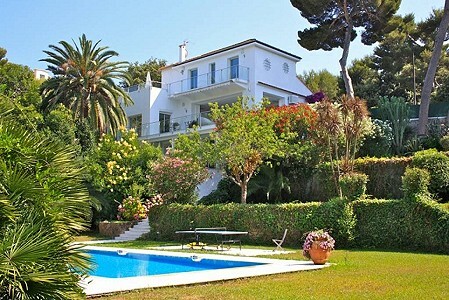 For this reason any Cap d’Antibes villa is in high demand, and located in an area quite unique in the French Riviera.